ACLs are a set of rules used most commonly to filter network traffic. They are used on network devices with packet filtering capatibilites (e.g. routers or firewalls). ACLs are applied on the interface basis to packets leaving or entering an interface. Let’s say that server S1 holds some important documents that need to be available only to the company’s management. 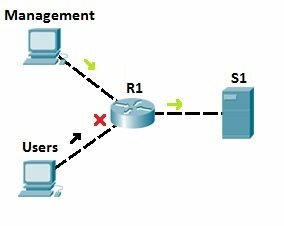 We could configure an access list on R1 to enable access to S1 only to users from the management network. All other traffic going to S1 will be blocked. This way, we can ensure that only authorized user can access the sensitive files on S1.